Sarah Barnard designs healthy, happy, personalized spaces that are deeply connected to nature and art. With a contemporary approach that employs traditional vocabulary, Barnard’s range of style is innovative yet time-honored. The ideas most essential to her practice and design process are wellness, historic preservation, and the infinite ways in which design can enhance life. Barnard is intrigued by clients who have unusual requests and lives for a challenge. She hasn’t met one yet that she didn’t like. Barnard loves designing for anyone with pets! She adores people who are avid collectors of anything they love. Barnard is incredibly down to earth, and people love her for her frankness. Barnard has been featured in publications internationally and was named a “Ones to Watch Scholar” by the American Society of Interior Designers. In 2018 Locale Magazine named Barnard “Los Angeles’ Favorite Interior Designer”. Barnard holds a Master of Fine Arts degree from Claremont Graduate University as well as undergraduate degrees in Art and Interior Architectural Design. Barnard is a member of the American Society of Interior Designers (ASID), is certified by the National Kitchen and Bath Association (NKBA), and is recognized by the International WELL Building Institute as a WELL Accredited Professional (WELL AP), the International Institute for Bau-Biologie & Ecology as a Building Biology Practitioner (BBP) and by the United States Green Building Council as a Leadership in Energy and Environmental Design Accredited Professional (LEED AP). She has served on the Santa Monica Conservancy's board of directors and has written several articles for important publications including the USGBC, United States Green Building Council. With my combined passion and experience, I have found nothing more fulfilling than creating functional and aesthetically pleasing environments that have a powerful impact on the lives of my clients. Stay Interiors' designs are Nishia's interpretation of her clients' style. Nishia has experience in designing kitchens & bathrooms as she also works as a designer at a high-end tile & stone company. We thrive on taking your vision of a dream home, translating it into it in a spatial and visual plan, and bringing it to life in your space. We do this by asking a million questions, showing you many images, putting items together into a design mock up, modifying, and finally purchasing and installing. 22 Interiors is capable of assisting and facilitating all of our projects from initial concepts to completion. We currently have projects all over the United States, including California, New York, and Washington DC. Our work has been featured extensively in local and national publications and blogs including Angeleno Magazine, Elle Decor, House Beautiful, Rue Magazine, and Modern Sanctuary. 22 Interiors has won Houzz Best of Design and Best Service in 2015, 2016, 2017. Most of 22 Interiors clients are busy professionals, many have never used an interior designer before, but they all want a finished, beautiful home and know they need help to achieve that. 22 Interiors encourages clients to be as involved in the process as they’d like - via pinterest and houzz boards, inspiration photos and mock ups. 22 Interiors is proud to have a completely transparent pricing system - forwarding all invoices and revealing all trade pricing. We want to make the process not only easy, but fun. A decade after its founding, Louise Voyazis Interior Design has become one of the premier design-build firms in LA. Our innovative use of space has transformed everything from bungalows to estates. Lori Dennis, ASID, LEED AP is an internationally known celebrity Interior Designer, speaker, best- selling author and star of HGTV’s The Real Designing Women. Partnered with SoCal Contractor, a licensed and bonded construction and remodeling company, Lori Dennis Inc. is a full service design build firm. They oversee interior design, landscape, development and construction in residential, hospitality, retail and commercial arenas. An award-winning Los Angeles interior designer, she has appeared in magazines, websites and television screens throughout the world including Elle Decor, LUXE, Dwell, People, the New York Times, House Beautiful, Coastal Living, Los Angeles Times and All the Best Blog. Recognized by industry leaders like HGTV, ASID, NBC, Viking and countless others as an expert in luxury and green lifestyles, Lori speaks at events around the globe. A mother-daughter duo, native to Los Angeles, providing timeless & classic interiors which reflect a strong integration of architecture and interior design. With our pulse on emerging Downtown Los Angeles and inspired by California's iconic past, DTLAdesign is one of today's leading Residential and Commercial Interior Design Firms. Joining LA's most innovative architects and builders, we create environments that reflect global awareness and sustainability while spotlighting products and people from Los Angeles and the surrounding areas. As collaborators exploring materials and form, every project has a distinct identity that engages and invigorates visitors - beautifully organic and everything but the expected. Oh beauty is an interior design company specializing in on-trend, inspiring design with an eclectic twist to make your home uniquely you! Client satisfaction is of the highest priority at Oh beauty. Elevating the art of home styling & vacation rentals, Bobou Housing is a new concept that transforms spaces into a livable aesthetic. A husband & wife duo based in Los Angeles, the two have experience designing tailored modern interiors to spacious minimal inspired spaces & everything in between. A Bobou interior welcomes you with it's contemporary sensibility and distinct sense of style. From home styling to luxury vacation rentals & interior design services, this duo creates exceptional environments. The couple transforms interiors & prides themselves on the service & hospitality they provide. Satisfied clients are their first priority and they provide luxurious & unique designs with attention to every last detail. Taylor + Taylor is a multi-faceted design company serving the Los Angeles area. Together, Jess and Jonathan strive to create functional interiors, transform and celebrate. Where smart design, sustainable choices and healthy living converge. Sarah Barnard Design undertakes residential interior design projects, commercial spaces and even single rooms. Los Angeles Based Full Service Design Firm | Houzz Recommended! Katrina Caso Design is a professional design studio Serving the greater Los Angeles area. With her signature style, Katrina attracts clients from far-reaching corners of the globe. With the belief that every person should come home to a special home, designstiles thrives on creating unique spaces with a sophisticated, stylish touch. Kelly Martin Interiors is a full-service, Los Angeles based design company that creates beautifully curated spaces where traditional style meets bold, urban elements and vintage details. Whether you’re starting with a blank slate or looking to refresh your current space, Kelly Martin Interiors will create a home that not only feels fresh and stylish, but that also tells your own story. KMI has a Los Angeles based office, however, we serve clients all over the country with our E-Design with KMI, allowing us to work with you remotely from wherever you live. To add to our interior design service, we also offer full service Art Advising to help you curate a beautiful collection for your home. We have networked with artists and galleries all over the world to find the perfect pieces to suit your space! Julie Townsend Maigret started her business in 2007. She has since developed a portfolio of thoughtful, comfortable, and often quirky residential and commercial interiors. Megan Grehl Design's specializes in high-end design in large-scale and smaller projects, often incorporating custom structural, furniture, and product designs. Zeinab Ghais has been working in the art and design world for over twenty years, drawing upon her unique upbringing, training, and skillful eye to infuse her art and designs with color, textures and natural influences. Born in Iowa to a Scottish/Irish mother and a Lebanese father, Zeinab spent her youth traveling the world. Growing up, she was surrounded by creative and talented artists like her mother and uncle. She earned a BFA from Savannah College of Art & Design in Savannah, GA, minoring in art history. Zeinab began her studies in interior design and migrated into designing and building furniture after realizing the joy that working with her hands gave her. A creative person by nature, Zeinab relishes in challenging herself to push outside her comfort zone as an artist, by trying different techniques and mediums. Her design philosophy is client centered. She believes that a space should be a reflection of the person who lives in it. Zeinab enjoys bringing a fresh perspective, energy, as well as infectious charm, to every new endeavor. Each project we work on is unique. Our mission is to provide a truly tailored service to create a design package that reflects your personal vision, aspiration and individual project requirements. Modiano Design is a multi-faceted design firm run by International interior designer, Aggie Kiss. Modiano Design offers a range of various home improvement solutions such as: INTERIOR DESIGN and HARDSCAPE services, Remodelling Services, 3D renderings, floor plans and permits, Interior and Exterior STAGING (preparing a private residence for sale in the real estate marketplace) pre-REHAB consultations for investors/developers and " do it yourself" consultations to homeowners. Modiano Design is 100% committed to customer service and customer satisfaction. With a passion for design, Tess brings her creativity to every project she takes. Whatever your style or needs, her goal is to create a space that you love no matter its function. Kerry is a Los Angeles-based interior designer with over ten years of experience. Trained at New York University, Kerry started her career in the world of event design in New York City. Her notable clients include Newark Senator Cory Booker, Gucci, and Ron Howard. 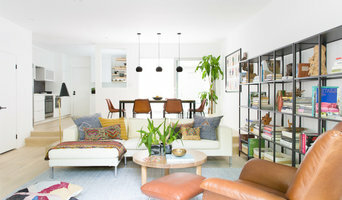 Upon moving to Los Angeles Kerry opened her own design firm, Kerry Vasquez Design, where she specializes in residential and commercial interior design, as well as editorial styling. Kerry's enthusiasm for the creative process and her unique style infuse every project with a singular and stunning look. Full Service Interior Design firm. Services include: staging, selection of materials, planning, management of project, design plans, services available for clients. FADE IN: INT. Home designed by MODERN NEST / DISSOLVE TO: Happy Client MICHAEL RASKY, formed Modern Nest in 2008 with a mission to create distinctive designs that tell your story. Focused on the client and their budget to create a true Hollywood ending. FADE TO BLACK. Having toured around the United States a few years as a stand-up comic, Michael Rasky decided it was time to plant some roots. Intrigued by the eclectic architecture of Los Angeles, he naturally segued into a career in real estate. 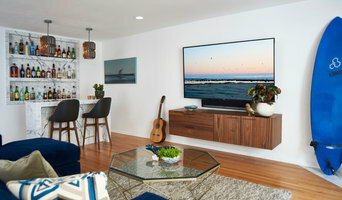 While matching clients with their potential dream homes, Michael discovered a mid-century post-and-beam home that needed a lot of work but had great potential. While working on the renovations, Michael fell in love with design. Building from that, he enrolled in the UCLA Interior Architecture program to further hone his design skills. The synergy between his real estate and design businesses has been an invaluable asset for his client base. Michael is able to identify unpolished gems and provide a guiding hand in transforming these houses into a dream homes. Email Michael to schedule a complimentary consultation. Brown Design Group is a residential & commercial interior design firm. Our passion for creating stylish, organic & contemporary spaces is matched by our efficiency & creativity in all of our projects. Cleo Rosa Interiors provides a full range of residential interior decorating and renovation services, from new construction to renovations of high-end residential interiors, from one-room make-overs to full-scale remodels. Danielle believes our home is a reflection of who we are, our values, and what we love. Along with her impeccable sense of style and design, she brings passion, a sense of fun and adventure to every project, believing every room should bring joy, have meaning and serve a functional purpose, while realizing her clients’ individual experiences and best-lived lives. Danielle’s background in behavioral science and organizational consulting lends itself to drawing clients directly into the design process. She believes the best projects are a collaboration among the client, designer, architect, builder and contractor. Her background in design across different disciplines and her intuitive understanding of who people are, how they live and what they want, result in her ability to create the best environments for life, work and play. Danielle’s aesthetic is born from the traditions of functional modernism, resulting in spaces defined by lack of clutter, clean lines and minimalism that are also cozy, balanced, and full of texture. Her philosophy is simple: what is important is how people feel in their environment. Every project focuses on authenticity and a genuine sense of place, resulting in meticulously crafted interiors that celebrate and enhance the individual experience. Danielle’s process is an integrative one, based on embracing each client’s vision and maintaining a strong avenue of communication. Every project is a journey of discovery and fruition, beginning with an interview and questions to understand the client’s needs and goals, and to establish time lines and budget. The next step is the creation of a design plan, including color scheme and overall design, followed by paint, furniture and fabric selection, sourcing and review. The last step occurs when the dream becomes reality and ends with the final walk-through. Throughout the process, Danielle oversees and coordinates delivery and installation with a discerning eye. From tailored modern interiors to spacious minimal inspired spaces & everything in between, a Bobou interior welcomes you with it's contemporary sensibility and distinct sense of style. Hive LA Home is a Los Angeles based Interior Design duo. We focus on collaboration with our clients to create warm, natural, welcoming environments that reflect a California lifestyle. Devon McKeon and Jessica Fleming have years of creative design experience from residential to commercial. Previous work can be found in private homes and exclusive hotels in Santa Monica, Brentwood, Hollywood Hills, Sherman Oaks, and Martha's Vineyard, MA. Prior projects have also been featured in Vineyard Times and ForbesMagazine.com. Denise Bosley, principal, is a full service interior design firm specializing in kitchen and bath remodels, home decor, full house remodels, and color consultations. Whether your project is large or small, from a construction nature to furnishing stages, we are committed to the design process and offer support in all areas.